You’d be forgiven for thinking Wellingtonians are determined to spend more time knee-deep in water. 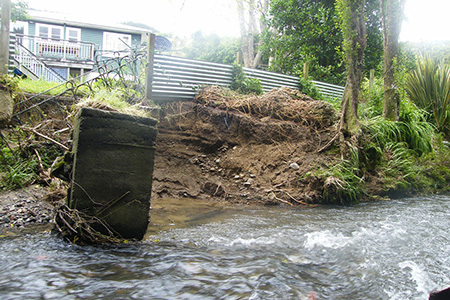 Talk Wellington looks at why our places are likely to flood more, and ways we can stop it. 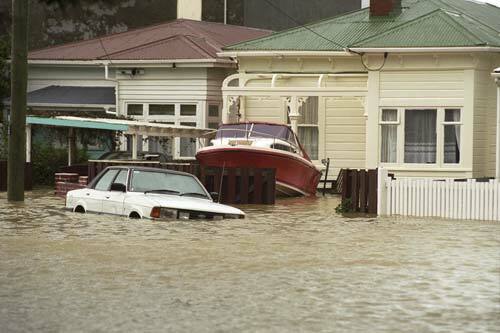 It rains quite a lot in Wellington, and floods quite a lot. And it’s very likely to rain harder in the near future (thanks, climate change). We’re waterproofing our catchments far more than we should, and if we want to avoid a much floodier future, we need to make our towns more absorbent. Building bigger pipes is just not a good option. TalkWellington will have a lot of kōrero on this over the next few months. 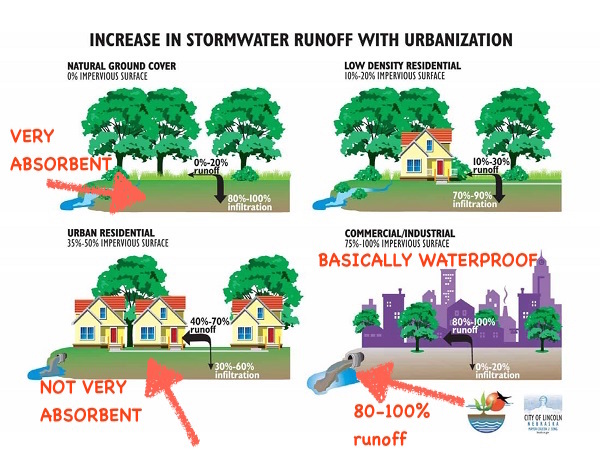 Stormwater is rain that’s running off the land surface, not soaking in because there’s something “impervious” (waterproof) – roofs, footpaths, carparks, roads and so on. In nature, most of what falls on the land soaks in; creeks and rivers receive only what’s left over once the soil is saturated, and after the rain’s finished they carry soaked-in water seeping slowly out of the wet land. Quantity is one thing – urban water hydrology is the movement of quantities of water, and that’s pretty interesting (especially if it’s undermining your house or filling up your subway). Water quality is another thing. Urban areas are pretty mucky, including seemingly harmless or “clean” areas like sealed roads and driveways, and galvanised roofs. Water picks up whatever it flows over, and stormwater (rain runoff) in Wellington goes directly into the streams and sea. We’ll look at that soon. Have a look at your place. When rain falls on your property, how much do you reckon soaks in, and how much runs off? What’s it picking up as it runs? Where does it go? Check out Wellington Water’s stormwater info – cape up to be a Water Hero!